Thixendale village is one of the most charming places to visit on a trip to the Yorkshire Wolds. Its location at the bottom of many intersecting dales is a delightful setting and makes it one of the most isolated villages in the area. A visit to Thixendale is a truly traditional village experience with a local pub, village hall, characterful church and village shop. The local community is keen to welcome walkers, with the village hall opening on Sundays to serve drinks and homemade cakes. Some residents even open their doors to walkers and offer cookies on rainy days! The local pub, Cross Keys, is much loved by walkers along the Yorkshire Wolds Way, offering accommodation and good food and drink in a cosy atmosphere. The pub is open during evenings and daytime at weekends. Other accommodation is also available at Manor Farm in the village. If you need further provisions then visit the village shop, serving all you need to refuel and refresh yourself for a day of adventure. It is well worth taking a walk from the village to the famous Robert Fuller Gallery. Robert Fuller is a world-renowned wildlife artist who grew up in the area and runs an acclaimed gallery at Fotherdale Farm, where he lives. The gallery houses a stunning collection of Robert’s artwork which is available for purchase. His passion for conservation inspires his work – a result of his father’s conservationist approach to farming. 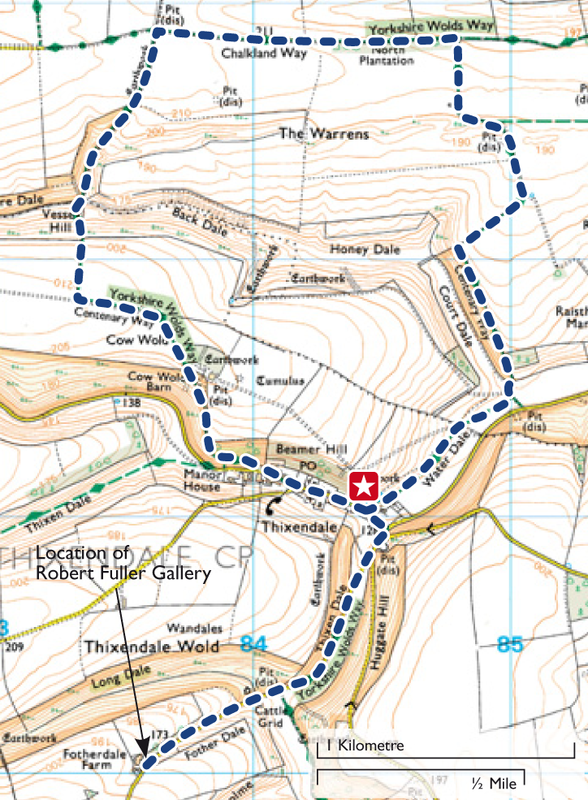 This walk allows you to see Thixendale and enjoy some of the delightful dry valleys and field tops of the Yorkshire Wolds. Strolling along it you will see why the East Yorkshire and Derwent Ramblers recognised the importance of having a National Trail here back in the 1970s. Please note: be mindful to avoid causing an obstruction for other people when parking your car.